Father’s Day recipes offer up so many options. Because Father’s Day is celebrated in June, it’s a great time for grilling: think steaks, fish, or chicken–whatever is Dad’s favorite! Kids will love getting in on the act to surprise Dad or Granddad by pitching in to create gooey desserts or yummy breakfast treats. The hard part may just be in deciding which meal to focus on—breakfast, lunch, or dinner! This is the perfect time to look for Father’s Day specials at local restaurants. Keep an eye on Groupon for the best restaurant deals for Dad. 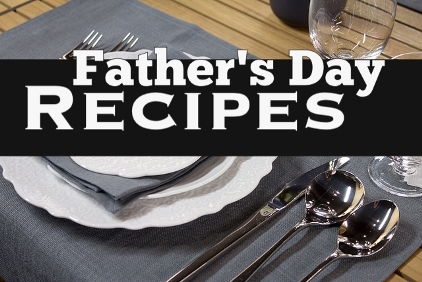 If you prefer to cook a delicious meal at home for Dad’s special Father’s Day dinner (and if that’s what he wants too), then check out these great Father’s Day dinner recipes. I’ve got lots of easy Father’s Day dinner ideas for you HERE. Get the day off to great start with these Father’s Day Breakfast recipes. If you’re expecting lots of family, you’ll want to focus on easy breakfast recipes for a crowd that include things you can make ahead, freeze, and then simply warm up that morning. A special Father’s Day breakfast in bed is always appreciated as well. Find all kinds of ideas for your Father’s Day breakfast HERE. Oh…yum! As much as I am committed to healthy, clean eating, Father’s Day desserts get a pass! For dads who are on limited or restricted diets, however, check to be sure that they can enjoy whatever Father’s Day dessert recipe you choose. Some dads consider the occasional, gooey, indulgent treat to be as fine a Father’s Day gift as anything else you could get, so keep that in mind as you check out the easy desserts to make that I have for you. Remember to keep it simple so you can enjoy making these easy desserts with the kids. Check out my Father’s Day desserts HERE. When I was thinking about the perfect Father’s Day recipes for my husband, I thought about what he would really enjoy doing: being at home, watching a game, and enjoying a plate full of his favorite snack foods. Father’s Day appetizers that include great vegetable dips, wings, pizza, and other hearty finger foods just makes sense for Father’s Day. See my favorite Father’s Day appetizers HERE. I think you will love these ideas! You’ll find lots of great ways to celebrate Father’s Day HERE on Faithful Provisions.